October's issue has some really exciting interviews and bios from Producer/Director/Actor- Grainger Hines starring in the latest Steven Spielburg film, LINCOLN. Producer/Director/Actor -Jay Russell of Southern Fried Stings. Publishing/Music- Kathy Cash daughter of the legendary Johnny Cash. Actress- Caroline O'Neil. Top Pageant Director- Michael Galanes from his show Little Miss Perfect and also hosted on Talk Soup. Rising Stars- Addy Miller, Lauren York, Vanessa Ore, Taylor-Grace Davis, Jerry Adams, & Tara Nicole Azarian. Fashion Designer- Nixy Wang with shopping pages of original gowns. Photographer- Lori Bartlett Harrell. The G.H.O.S.T team do a paranormal investigation at the Springvilla house. Casting Calls and Info. Articles, Upcoming Events hosted by Entertainment Empires, Upcoming pageants, Editor's picks, Contest Winners and so much more! Get your copy today! The Go-To guide for talents in the Industry of any type. Interviews with Producers, Directors, Actors, Performers, Etc. 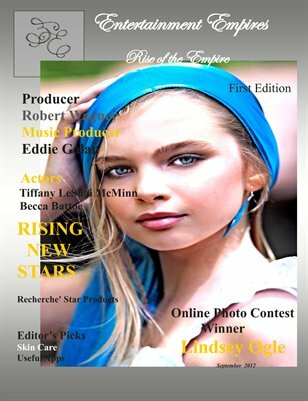 Rising Stars, Articles, Casting Calls, Upcoming Events, Contest Winners, Shopping Pages, and so much more! Entertainment Empires first edition is finally here! Go-To guide for "Industry" talents. Producer-Robert Wagner, Music Producer- Eddie Galan, Actress- Becca Battoe, Actress- Tiffany LeShai McMinn, Casting Director/Producer/Acting Coach/ &..... ....Co-Founder of Entertainment Empires- Maxann Crotts-Harvey. Rising Stars, Casting Calls, Contests, Articles, and so much more!!! Available now for sell. Make sure you FOLLOW Entertainment Empires magazine to always get the latest news! 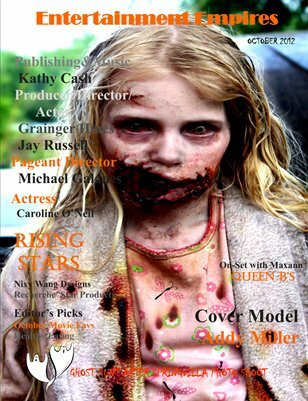 www.MagCloud.com Entertainment Empires magazine. Entertainment Empires- The Go-to guide for talents in the Industry of any type. Interviews with Producers, Directors, Actors, Performers, Etc. Rising Stars, Articles, Casting Calls, Upcoming Events, and so much more!